The Ballentine Vineyards is an ideal setting to taste a family legacy. The legacy of Napa Valley winemaking stretches back many generations at Ballentine Vineyards. Betty and Van Ballentine, who met when they were kids, both grew up in grape-farming families. Betty's grandfather, Libero Pocai, moved to Calistoga in 1906 and bought 60 acres of the best possible vineyard land. Van's parents both moved to St. Helena in the early 1920s, met, and were married. With his eyes on the future, Van's father purchased an abandoned winery. When Prohibition ended, he was one of the first to apply for--and receive--a winery bond number. Today, Ballentine consists of 100 acres of vineyards in three locations: Crystal Springs Vineyard at the base of Howell Mountain, Pocai Vineyard between the Napa River and the Silverado Trail, and the home vineyard in St. Helena. After selling their grapes for years, Van and Betty resurrected the Ballentine brand. 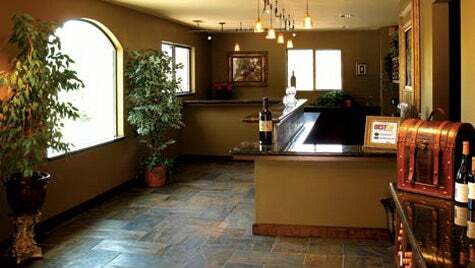 In 1995, they built a winery behind their 100-year-old farmhouse with the original bonded winery number. Winemaker Bruce Devlin has been on board for the past 10 vintages. In addition to studying winemaking in the United States, Bruce spent a couple of years overseas to gain an international perspective of his craft. His research has certainly paid off. Ballentine, which is the largest producer of estate-grown Chenin Blanc in the Napa Valley, reaps many medals and much praise for its crisp, dry-style Chenin Blanc. In fact, the 2008 Old Vine Chenin Blanc was the only Napa Valley white wine listed in Wine Enthusiast's list of the Top 100 Best Buy Wines of 2009. With different varieties dating back to the early 1900s, Bruce is able to create several excellent old vine wines, including the 2006 Old Vine Zinfandel, which received a 92-point Editor's Choice award from Wine Enthusiast. The view from Ballentine Vineyard's recently remodeled tasting salon is breathtaking. In every direction, guests are treated to views of Spring Mountain, the Palisades, Mt. St. Helena, and Howell Mountain. It's an ideal setting to taste a family legacy in award-laden, 100 percent estate-grown wines. Take Hwy 29N north of St. Helena. Turn right on Weinberg Rd. The winery is on the right.